And in case you changed you changed your mind about the place you jumped to, you can hit the return arrow shown in the Address Box to get back to the previous location. 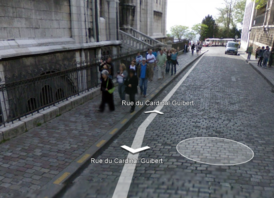 Now you can wander through Street View imagery and not worry about getting lost! We hope you find it just as fun and useful, so to get you started we have put together a video to show you all the things you can now do with smart navigation. Enjoy! 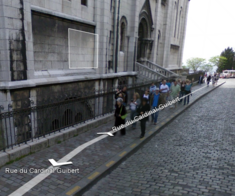 Street View is a great way to see panoramas of streets from all over the world. We've launched some great improvements to this tool, including most recently overlaying user photos and the ability to view Street View in fullscreen. Until now though, the usual way to navigate through Street View has remained the forward and backward arrows along the roads which move you to the next immediate panorama. Today, we are really excited to introduce a new mode of navigation which liberates you from the road arrows and gets you where you want to go in just a few clicks. You can now use Street View's smart navigation to travel to a new place just by double clicking on the place or object you would like to see. We have been able to accomplish this by making a compact representation of the building facade and road geometry for all the Street View panoramas using laser point clouds and differences between consecutive pictures. As you move your mouse within Street View, you'll notice that the cursor now has lightly-shaded geometry attached to it - it will show an oval when your mouse is following a road and a rectangle when moving across the facades of buildings. We affectionately refer to this cursor geometry as the "pancake" because it has the appearance of a pancake laying flat to the object where the mouse is pointing. By giving you a sense of depth,it makes the flat image almost feel three-dimensional! Double clicking on the pancake transports you to the best panorama in that direction. 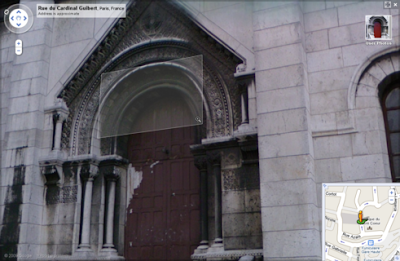 For instance, if you pick the front door of this church, you will be taken to the view shown below. Sometimes the pancake shows a little magnifying glass in the bottom right to indicate that double clicking will zoom in on the current image rather than transport you to a closer location. This happens when we've determined that the current panorama has the best view of the selected location.